A Marvellous New Symphonic Work that plays “Just like an epic film score in search of an epic film to match the quality of the music“ . Featuring the acclaimed 80-piece CITY OF PRAGUE PHILHARMONIC ORCHESTRA with Solo Violin: Lucie Svehlova. Sessions produced by James Fitzpatrick. Composed and Conducted by JEAN-PHILIPPE VANBESELAERE – brilliant French composer of film and TV scores, concert works, operas and ballets. 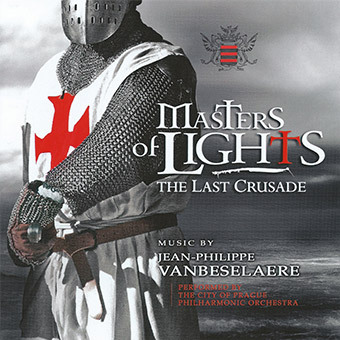 MASTERS OF LIGHTS is a lage scale musical tone poem about the Crusades featuring memorable and majestic symphonic themes with more intimate romantic music and suitably religioso motifs as well as lively, celtic influence, folk tunes and airs. A worthwhile new discovery for any fan of melodic and exciting orchestral music.